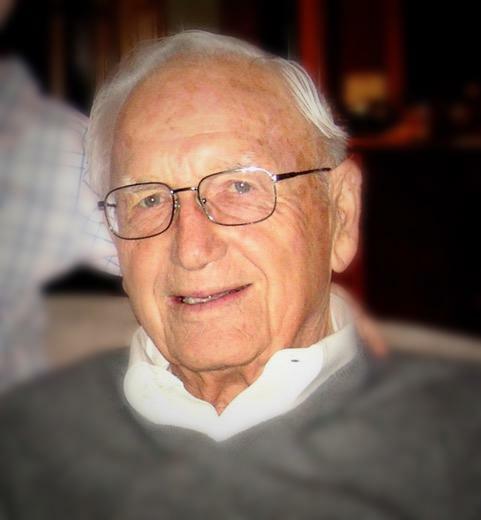 Chuck Bleeg passed away peacefully at home on November 10 with family by his side. He was 96 years young. Born in 1922 to Charles and Alma Bleeg, Chuck grew up in the Irvington neighborhood of Portland. A lifelong Roman Catholic, he attended Madeleine School and Columbia Prep high school. He saw combat in France and Germany in 1944-45 in the 20th Armored Division, 220th Engineers. His company helped to liberate the prisoners at Dachau concentration camp. After the war, he graduated from the University of Portland with a degree in business administration and started a career with General Motors Insurance. He married Virginia Sharkey, the girl from just around the corner whom he’d known all his life, in 1950. Together they raised five girls and two boys only about five blocks from where they had both grown up. He taught his kids how to take a corner at high speed, clean a duck, hit a drop shot, get critters out of your chimney, engineer a culvert, rewire a house, and deal with difficult people. As a dad, he masterminded ski trips, crawdad feeds, secret walks, and Sunday drives. In 1967, he and his brother, Jerry, bought beach property near Brookings, Oregon, and spent the 1980s building a house big enough for all 13 of their children to gather and enjoy whatever the sea put forth. “Keep ‘er in the road,” was his best advice on life. In 1953, he established Chuck Bleeg Motors on 16th and Sandy. His neon sign read, “Finest Used Cars in the World,” and generations of Oregonians faithfully bought cars from him. At its height, in the 1960s, Bleeg Motors employed two full-time mechanics and one salesman. His children recall getting rides to school in Corvettes, dune buggies, and army troop carriers, and once, jumping out of the back door of a long black hearse. His son, Chuck Jr., took over as mechanic in early 1980s while Chuck Sr. worked the deals. He never retired from the car business, becoming the oldest continuously operating car dealer in Oregon. Folks driving down Sandy Blvd. would take comfort seeing Chuck in his rightful spot in his corner office as late as a month before his death. Chuck’s interests were varied: As such, he had fishing friends, tennis partners, car business friends, childhood friends, skiing friends, woodworking friends, war buddies. He had the gift of conversation with any human being, young or old, lowly or mighty. His wit was infectious, riotous, dangerous. He was the funniest man we knew. Chuck leaves behind his patient and loving wife, Virginia; daughters Margaret Smull (Rick); Joan Bleeg; Ann Welch (Terry); Susan Bleeg; and Sarah Morris (Keith); and sons Chuck Jr. (Lynn) and Paul (Rosie). Nineteen grandchildren and six great-grandchildren will continue to benefit from “Popo” Bleeg’s wisdom and industry, as will his many beloved nieces and nephews. He was preceded in death by his kid brother, Jerry Bleeg, and big sister, Carol Boire. A Mass of Christian Resurrection will be celebrated on Friday, November 30 at 10:30 a.m. at St. Mary Magdalene Catholic Church (The Madeleine), 3123 NE 24th Avenue, Portland, with a recitation of the Rosary immediately before, at 10 a.m. Chuck will be buried at Mt. Calvary Cemetery. In lieu of flowers, remembrances in Chuck’s name may be made to the Madeleine Parish for the restoration of the old church (where he and Virginia were wed), or to the Providence Child Center.